Purim 2010 will begin with the Megillah reading on Saturday night February 27. Every year at the first signs of spring, I get a tickle up the back of my neck telling me its time to start planning and baking for the Purim celebration. Have you ever heard the Yiddish phrase, or now I guess its part of the English lexicon as well, ‘the whole megillah’ megillah means story book in Hebrew. In the case of Purim, specifically the story of Queen Esther in ancient Persia and how she saved the Jewish people from destruction at the hands of Haman and his followers. 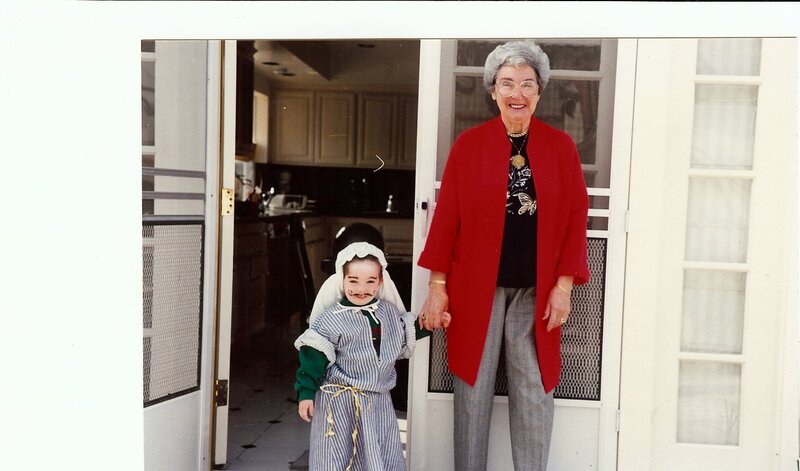 When my children were young I spent a lot of time fretting about what costumes they would wear to the Purim carnival and to the Megillah reading. Incidentally the reading is not what one would think of , a decorous calm service in the synagogue. It is a raucous recitation of the story with people talking out of turn, and every time the name of Haman is mentioned the crowd erupts booing, stamping their feet, and whirring their graggers into a loud cacophony. Would Mitchell be the evil villain Haman, and Jacob be the blessed uncle Mordechai or the King Ahashverosh (phonetic). No Queen Esther, I only have boys. The celebration of Purim is full of costumes, goodies, parties and for adults, and libations. Since I became a homemaker, I keep up the tradition of making Purim Platicos or Platicos de Purim otherwise known as Mishloach Manot. I try to keep it to about 25-30 platicos. What are Purim Platicos you may be wondering? 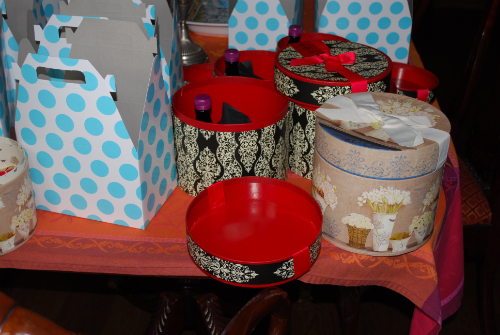 They are plates, baskets, boxes, and all manner of conveyances filled with sweets, fruits, and special goodies. Since Purim is a happy festival, celebrated with a special meal, it is nice to remember your friends and family as well. The next day after the Megillah reading, I drive around and deliver my Platicos to my list of family and friends. I plan out a logistically short route, load the car, and go. I try to enlist my kids to help but that is getting harder to do since they don’t live at home any longer. One of the things my mother always baked was Folares. Folares are pastry dough flecked with cheese in a cage like shape representing Haman’s (the evil villain in the Megillah) hanging noose. Encased in the cage or noose is a hardboiled egg representing Haman’s head. Haman meets his end in a noose on a gallows tower at the end of the Megillah, after failing in his plot to have the king hang all the Jewish people in the gallows he constructed. This year I will fill my Purim Platicos with Folares, borekas (cheese and potato), black cherry filled hamantashen (a wonderful Ashkenazi Purim pastry representing Haman’s hat), chocolate fudge brownies, pistachio biscotti, chocolate bars, and mini banana cakes. I think I had better get baking. Following, is the recipe for Folares, and in my earlier blog posts you can find the recipes for pistachio biscotti, banana cake, and cheese borekas. 1 recipe of dough for cheese and potato borekas with the addition of 3/4 cup grated parmesan cheese to the flour. 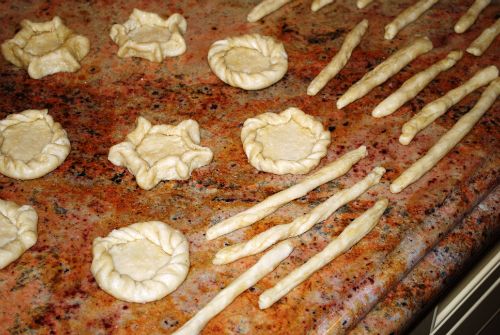 Make the dough as for borekas, with the addition of 3/4 cup of grated parmesan. Separate the dough into balls, a little larger then a golf ball. Leave 1/3 of the dough aside to make the ropes for the top cage. In the meantime, place the eggs in a saucepan , cover them with cold water and the 10 drops or so of food coloring and put them to boil. When they have boiled for 10 minutes, pour off the water and let them cool. With a rolling pin, roll out the balls to about 4-5 inch circles. Pinch the edges up to make a platform, or holder for the hard boiled egg. When the eggs have cooled , place an egg in each of the platforms you have made. 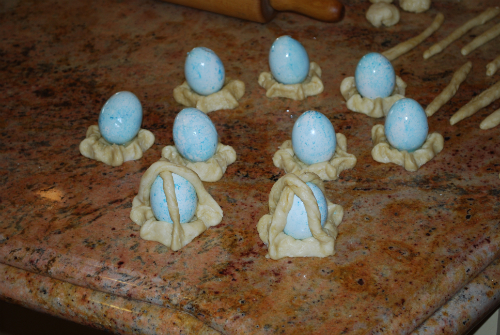 With the remaining dough roll out thin ropes and place them criss-cross over the egg, attaching them to the base platform, so they stay in place. Bake in a 400° oven for about 20 minutes until golden brown. You can eat them at room temperature. They are good for breakfast or served at a dairy Shabbat lunch.